Minsk World is an exceptional real estate program of 3 million square meters with an accent on high-tech and ecological design. 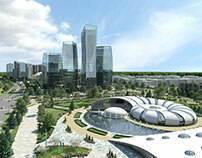 Minsk World aims to be a major architectural and urban event in Belarus and surrounding countries with outstanding financial, business and entertainment role in the region. We are looking for the design with universal appeal and act as a symbol of honor and inspiration for thousands of people in Belarus and beyond, connected with our project. We are interested in the design which expresses the unique character and ambition of the project. Do you currently work at Minsk World contest ?